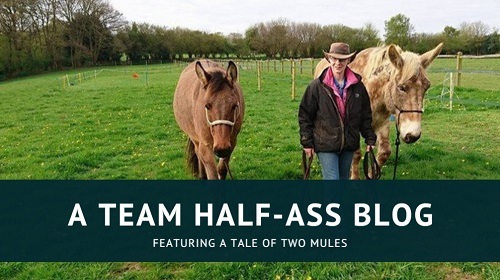 I’m very excited to bring you a slightly different Mule Tale this week – the transatlantic adventure of Sheril and her molly, Diamond, who came all the way from the USA. 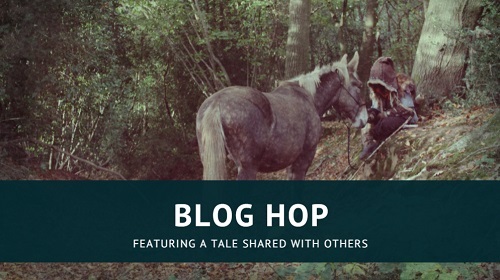 I am really grateful to Sheril for agreeing to tell her story, as I think it’s a fascinating one and may be helpful to any other UK owner who has not been able to find the riding mule they want in this country. I hope to have Sheril back for a traditional Mule Tale once she and Diamond have got to know each other better. 1. Why did you decide to import a mule, and how did you choose her? 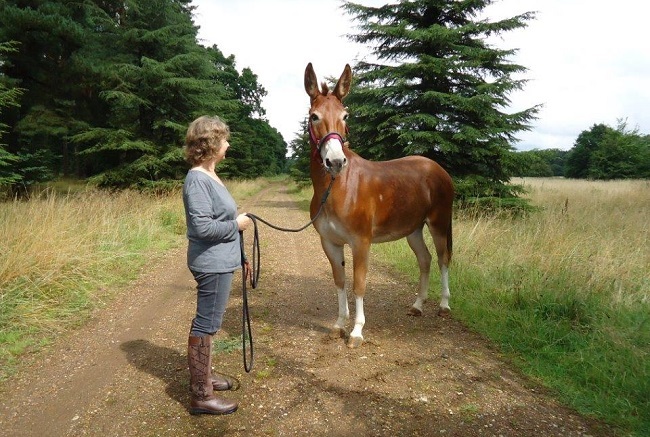 I had a fantastic 15hh spotted mule called Muffin for 16 years. I bought him from neighbours Brian and Rosie, who had imported him and another young mule called Millie from the USA. Ostensibly, I got him to teach my own partner at the time, Brian, to ride and to be his mount. Why would I need a mule? I rode horses! But little did I know what fun I would have with Muffin and how he would convert me to the joys of long-ears. 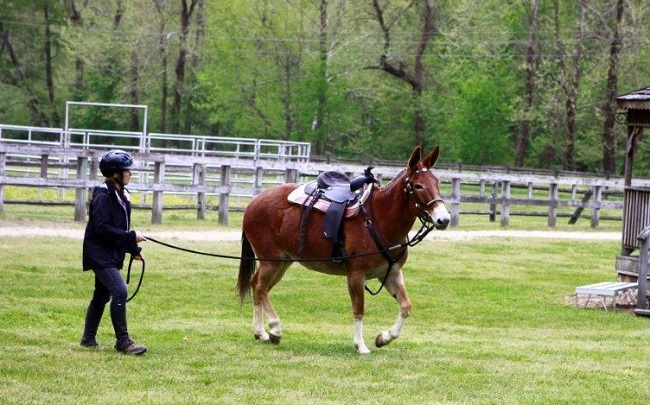 He was a great trail-riding mule and also really enjoyed endurance rides. He taught me so much about how versatile and wonderful mules can be, and what special characters they are – and when I lost him aged 25 years, it felt like I had lost a dear and trusted ‘rock’ of a friend. Although I knew he could never be replaced, it just felt odd to contemplate the future without the joy of another long-eared companion. I knew big riding mules were as scarce as hen’s teeth in the UK, but I got to thinking, if Brian and Rosie could do it, why couldn’t I? And so the adventure began – to find a new mule from across the pond. 2. How long did the process take, from buying your mule to her arriving at your yard? From beginning (i.e. first contacts made in US) to end (Diamond arriving at my home), around 15 months. In truth the process of finding and buying her was much, much quicker than I originally envisaged. I knew I would need a lot of help to be successful in my venture – it is hard enough finding the right horse to buy in the UK, let alone equine hunting in another country and culture! So I initially sent out a couple of tentative emails to well-known mule folks in the US, to see where it would lead – Meredith Hodges was one of the first because I had her book on training mules and donkeys sitting on my shelf at home. I was bowled over by the genuine warmth and helpfulness of Meredith and indeed everyone who I contacted – and some of those people have become wonderful friends as well. So I first started contacting mule folks in the USA in around May 2014. My plan was to make an actual trip to the US in the spring of 2015, just as a fact-finding mule tour, and to see if my quest was really feasible, or whether I would decide it was a madcap scheme and abandon the project. 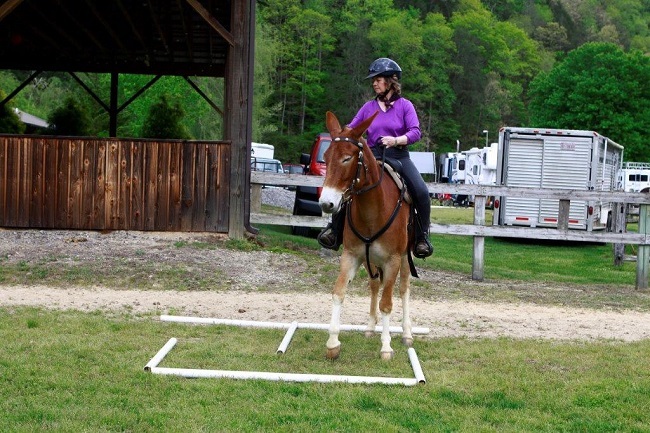 As it turned out, by the time I reached the US on my mule holiday in May 2015, I had already bought my new mule Diamond and I was able to meet her and ride her for the first time, in the Leatherwood Mountains, North Carolina, at a ‘Mule Days’ event while I was there. That was the icing on the cake! 3. What obstacles did you come up against? I’m not sure there were any ‘obstacles’ as such. I had been warned, and told myself as well, not to buy a mule at auction. Partly because the outcome is so uncertain, you don’t necessarily know what you are getting, and the prices can go dizzy-makingly high. 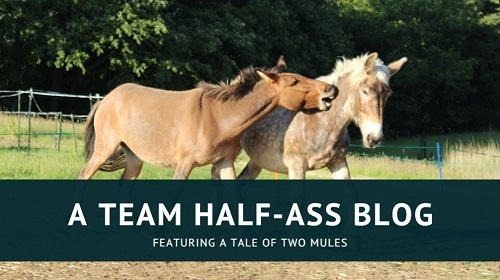 But then I also had a dawning realisation that looking at mule ads was not going to get me very far either. 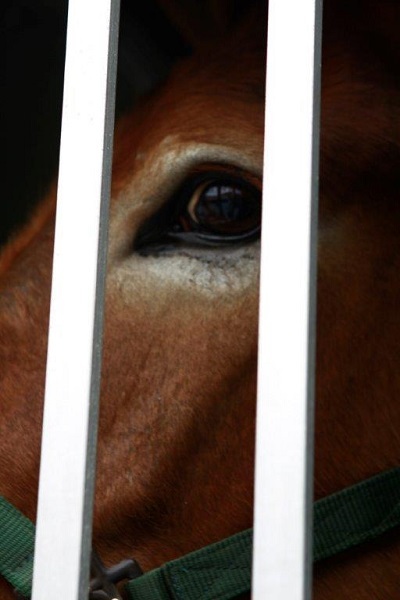 I remember expressing interest in one mule in particular, from a highly reputable trainer, that sounded exactly what I was after – but while I was sitting in the UK wondering whether I should book a flight to go and try him, he was snapped up by a cash buyer. I realised I was always going to be several steps behind the game in that scenario. In the end, I did buy Diamond at a public auction – however, I knew her background, through friends and contacts I had made, and my friend Shannon had already tried her and filmed her for me before the sale. I also had her vetted before the sale. The big advantage to the auction was that I was just like any other buyer who was there on the day, although I was bidding over the phone, I had as much chance as anyone of getting her. But it was a nail-biting time, because I had to make arrangements ahead of time as though she was definitely going to be mine by the time she walked out of that sale ring … yet all the while knowing that I might well lose her to a higher bidder on the day. Equally I had to be very strict about setting myself a price limit and promise myself that I would not be tempted to go over it in the heat of the moment – because there were so many other expenses to pile on top after the actual purchase. My phone line went down on the day of the sale. I had to re-organize everything and go and place my bids from my friend’s house … SO stressful!! The biggest stumbling block seemed to be the quarantine and travel arrangements. Although I tried to be well prepared with information, it turned out I had not necessarily asked the right questions or been sufficiently thorough. I would do things differently with the knowledge I have gained … but as I am not planning to import another equine, that knowledge is somewhat redundant! Suffice it to say it was a stressful time, trying to get my new mule across the US from North Carolina to Texas, where the quarantine facility was, and, once she was there, it seemed to take an inordinate amount of time to get her actually starting her quarantine in preparation to be shipped to the UK – for reasons I still do not fully understand. She therefore spent from mid-May until the end of August twiddling her hooves in Texas, while I gnashed my teeth and felt increasingly frustrated at the delay – especially as I had envisaged spending all summer getting to know her. 4. Were there any surprises or particularly memorable moments? I guess the biggest surprise to me was the sheer warmth and genuine kindness of the mule community in the US and elsewhere too. Everyone I specifically contacted or met seemed to go out of their way to be helpful. Shannon, Diana and Dave, Donna, Sue Cole (of Mules and More magazine) and her family, as well as Jay Lankford (Diamond’s former owner) and Noelle Coryell (who trained and prepared Diamond for the sale) – all were so generous with their time and advice. The most memorable moments for me were my first sight of Diamond when she arrived at Leatherwood resort … the glimpse of that shining, intelligent eye through the trailer partition. And then meeting her in the flesh for the first time – she just exceeded all my expectations. 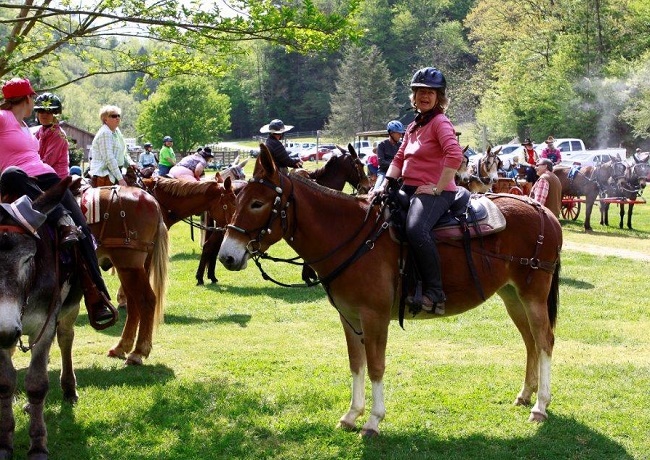 Having the opportunity then to ride her in some of the classes at the Leatherwood Mule Days, and in the parade with all the other mules, and to trail ride her there too, in that wonderful scenery – was just such a highlight and I will never forget that special time. That trail ride was such an emotional moment for me, the tears just started running down my face – as Diamond set off in front of all the others, loving the adventure; her attitude just reminded me so much of my dear Muffin. 5. What advice would you give to anyone looking to import a mule (or any equine) from overseas? That’s a really difficult question to answer without going into long screeds of information based on what I have learned through the process. But I would say first and foremost to make some really good contacts in the country where you are looking – people whose opinion you trust … that is probably the most important thing, because you are bound to need lots of help and advice. I think it is also very important to have clear in your own mind what you are looking for, what points are absolutely essential, what you are prepared to compromise on. I made a sort of ‘wish list’ of desirable traits and experience that I would like my new mule to have. But in the end, I think you also need to follow your instinct and fall in love a little bit with whatever animal you intend to buy. Potentially there is such a vast choice, and you need that special spark to help your decision. You’re welcome – thank you for helping the plan come to fruition! I think Sheril has embarked on an incredible adventure, and bringing her mule home from across the ocean is just the start of it. Great article!! I was an adventure on this end too but it is funny how when things are right, they just all work out! Diamond is a very special mule, one of only a few like her even here in the USA, I have ever come across and I was so happy that Sheril ended up with her. It was a genuine pleasure to meet Sheryl on her travels to pick up her Mule Diamond at Mule Days at Leatherwood. We still on occasion talk with each other, a true pleasure to have met her. Hope to adventaully read the next article on Sheryl and her muke Diamonds adventures! Spring is here – and so is a happy mule.